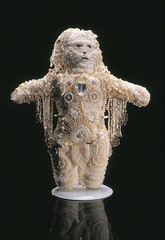 another old favorite - and actually i think this was the 1st beaded doll i ever made. the yeti is 8" tall. later i also made a female yeti, carrying a baby in a papoose. i bead my dolls on ultrasuede, stabilized with fusible interfacing on the back. then i assemble and stuff after i do the beadwork, finally adding fringe. it's tedious to stuff an already beaded doll - the bits of stuffing want to catch on the beads. most other people i know doing beaded dolls assemble and stuff the doll 1st, then bead. but i could not get the control i wanted to get this much detail unless i beaded on a flat surface and then stuffed, so this is the method i came up with. i don't bead nearly as much as a i used to. but i think i'll be coming back to it sometime.. when the time is right. like, say, after i've gotten that fancy ott floor lamp. my eyes are not what they were 20 years ago when i started beading! here is something i did in 2007, with seed beads, freshwater pearls, vintage and contemporary pressed glass beads, and a pewter bunny charm. 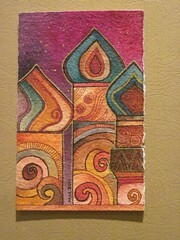 i beaded this piece onto a "sandwich" i made of 2 layers of hand dyed batik with wool felt between the layers. 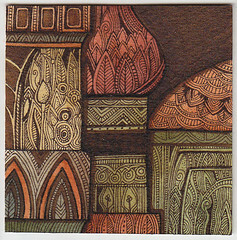 sometimes i let the batik show through, but not on this piece. 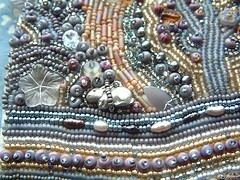 somehow the fabric affects the design while i am beading, though, wether or not i let parts peek through. 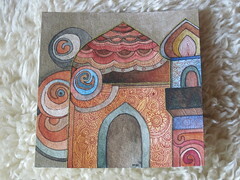 Here is another little gem from the Minaret series, It's just 4 x 4" and it is on etsy. 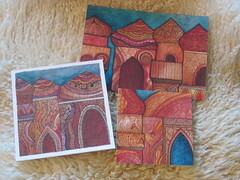 I am excited to have listed some of my new Minaret paintings on etsy. This is the 1st time I've offered any of these for sale. What a busy week! I have not painted at all... I hope to get some time this weekend. I've been knitting a bit and reading (a charming mystery by Kerry Greenwood called Away with the Fairies. A witty flapper detective investigates the murder of a saccharine writer and illustrator of fairy tales. This weekend looks to continue the cold streak we are experiencing so it will be a good time to stay in and do art. 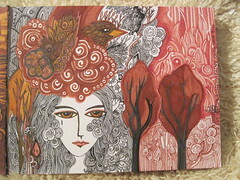 as i mentioned in my previous entry - this is the fiery color palette. well, maybe not fiery, but somehow it seems to glow. i love three day weekends. this may not come as a surprise to you, but i've been painting. and some reading. i ended up using a little different color palette here. i seem to have shifted a but from fiery colors to earthy colors. 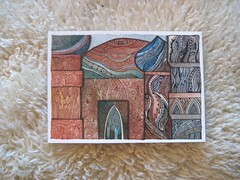 Another in the Minaret Series. This one is a bit early - the color palette has evolved somewhat, gotten warmer. 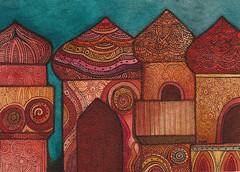 I do quite like the onion dome on the right in this one, though. And the background, which does not show up too well here but is a rich bronze. Last night I went out with my neighbors to a show at Bottlehouse over in Madrona, her silkscreen posters. Her name is Molly Leonard. MY favorite is the sasquatch! And Molly was really sweet and charming and the kind of person you just want to be around. So that was enjoyable. You know, I have heard some people leave the house when it is dark out so I thought I would give it a try. This weekend I am so excited to have a solid block of art time. well and a few chores if i can make myself..
this one reminds me of things folding and unfolding, spiraling in and out, coming nearer and then receeding. hence, the title. my "real" job has been quite busy and probably will be for at least 3 more weeks or so. then.. we'll see. it drains my energy enough that i do not have as much of myself left for my art. but still i do what i can. AKA why i stayed up too late last night. 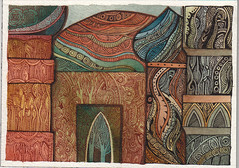 This is a tiny little painting I did for a sort of color sample for a larger work. I think I am going to end up doing the buildings all in warm colors and the sky in blue. Though i do love the purple sky here and will probably use that color soon for something. 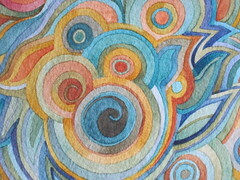 Speaking of color, my mother and I went to the weaving show at the Burke Museum, this weekend. 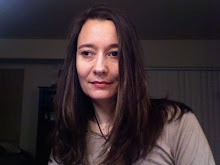 Some of you know that my mother is a weaver and that my twin sister grew up on a sheep farm on Vashon Island. I think my favorite part was seeing the samples dyed with natural dyes. When I was a child my parents dyed yarn and wool using various natural products- onion skins, marigolds, etc. Now my mother prefers commercial dyes for their bright colors. 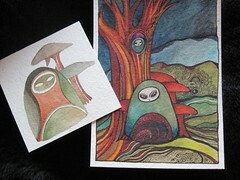 here is a little detail from one of the pages in my sketch journal - I call it mute forest. It seems like it has been a long week! I am going to Tacoma to work tomorrow, so I imagine it will be a long day. I am looking forward to the weekend. I'll tell you what hermits realize. If you go off into a far, far forest and get very quiet, you'll come to understand that you're connected with everything. This is one of my most recent sketch journal pages and I think so far my favorite in this journal. 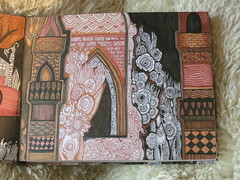 As you can see, after taking about 6 weeks off, I am back thinking about the Minaret series of painting I am doing. 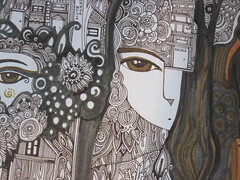 I hope I have some watercolors to show you soon.. in that series, but t least I am thinking along those lines again! i am not watching the superbowl. i am not sure who is playing. the packers i think, and someone else. my house is quiet. it's peaceful. knitting: a green skirt and a brown feather and fan scarf. both for myself. drawing / painting : nothing of note other than sketch book. p.s. 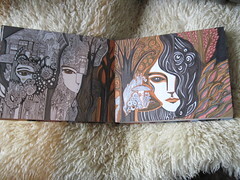 this spread is called "mute forest". i don't know why, it is just the name that fits. I've uploaded a few more pages of my sketch journal to FLICKR if you want to click through and see them. Naturally it takes a long time to do a page, they are so intricate, and sometimes i try to go less intricate and leave some white space .. but. i might learn to do that some day. i intellectually understand white space but my intellect is not enough to pull me out of the ways my pen leads..
happy groundhog's day. only i've never drawn a groundhog before, so you get a mouse, also a member of the family of rodents, so i hope close enough. 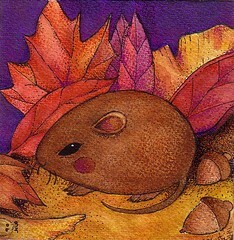 this little dear is 4 x 4", watercolor, ink, and prismacolor colored pencil on watercolor paper. i drew it in 2006.
when you are feeling blue it's not easy painting. i have not painted anything of note since christmas. 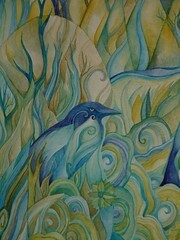 so this is one from the archives.. a detail from Ravenwood, 16 x 20", watercolor on paper. It's hanging in my living room. It's over my tv, but really it's more interesting than my tv most of the time.